As part of a recent project we had a requirement to manufacture a cylindrical pressure vessel which was to be pressure tested to 10bar shock. To create the internally domed lid we utilised the hydraulic copier attachment on one of our vertical borers. Although in many cases these copier systems have been surpassed with the use of CNC machines with live tooling, they allow us to create intricate convex and concave radii within a 6ft bed without the high costs associated to a CNC equivalent. 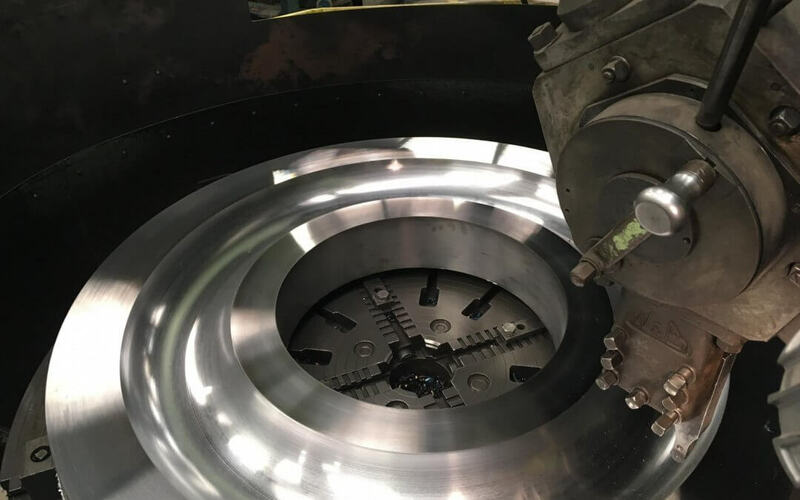 To manufacture this lid we purchased two profiles, one being a 390mm x 170mm x 6mm thk profile with 115mm radius cut out to use as a template and the other a 1535mm OD x 620mm ID x 165mm thick ring to machine the lid from. The template profile was then fixed to the copier attachment and the large disc was fastened to the bed plate of the machine.One of the benefits of this system is that the normal operation of the machine is not compromised as the changeover to trace is automatic. The operator uses the normal rapid-traverse and feed, bringing the stylus in line with the starting point of the trace cut, once the feed control lever is brought back to neutral the stylus then seeks the template and commences tracing the contour. A tracer valve coordinates the feed rates for the two motors, so that the feed remains constant over the entire contour. The tracer head contains a small electric motor for oscillation of the valve spool which eliminates static friction and permits the valve spool to respond to every movement of the stylus. Having constant stylus sensitivity, repetitive accuracy is assured allowing us to create a wide range of finished items with relative ease. Our managing director, David Cottam, recognised the potential for adding a VBM with a hydraulic copier and elevating rail system in 2012. The reasoning came from the fact that we found, due to the markets that we operate within, that by adding this capability we were adding a unique selling point to our arsenal. At the time we had horizontal boring capabilities but decided that the acquisition of a vertical borer was a necessary investment. As a specialist sub-contract engineering business we offer a one-stop shop for engineering requirements, with machining after fabrication a key component of our business model. Whilst relieving the need to sub out large machining after fabrication, we have also found that by increasing our machining capacities we have acquired new custom through clients such as Imerys who have a large presence in Cornwall.